Louis Alterie signed photo inscribed; To my friend and pal Dino from Dimond Jack Alterie. Photo taken in 1925. Clyde Hays, Kid Haynes, Jack Devine, Lew Aleries, Diamond Jack Alterie, Louis "Two Gun" Alterie some of the many aliases suiting him when the need arose. His real birth name was Leland Varain. He was born on the August 2,1886* in California to Mary Lincoln Brown and Charles Varain. He is of French and Spanish ancestry. He had a brother (Albert), four sisters (Hazel, Edith, Ida and Nellie) and one step sister (Dorothy). Being his daddy was a bonafide cowboy and rancher, Leland followed his dad's and this passion stayed with him through his youth and gangster days in Chicago. He was not a pretend cowboy as most would think, but a real honest to God one. This passion even rubbed off on his close pal, Chicago Northside crime boss Dean Charles O'Banion. The two were inseparable during their short friendship in Chicago and Leland brought O'Banion and his new bride Viola to his Colorado ranch. * his death Certificate lists his birth as August 2, 1885 and the 1900 census has him at 1891. Take your pick. Back of frame shows this was given by Dorothy to her mother on Mother's day 1934. This may have been Alterie's stepsister giving this photo to her mom Mary Lincoln Brown. Leland was married two times and once divorced to Mabel "Mamie" Hays and at the time of his death to Ermina "Erma" Rossi. In the beginning of 1920, Alterie and his new wife Mamie settled in their new rented abode in the city of Los Angeles where he made his living as a Private Detective and she was a hairdresser. Restless and always with the search of adventure, Alterie heads out to Chicago around 1921 where he befriends Samuel "Nails"Morton, a World War 1 hero and Jewish Northside gangster. Through Morton, Alterie meets Dean O'Banion and takes a quick liking to the brash hoodlum whose actions followed his bravado. Many talked the talk, but seldom few walked the walk. O'Banion and Morton always followed through on any their promises or threats. While in Chicago, Alterie makes the newspapers often beginning on January 2, 1922, when a man whips out a gun and shoots a patron dancing through the cheek at Al Tearney's nightclub at 336 35th street and Calumet. Alterie is arrested and gives his name as Frank Ray from New York. Charles Strauss was a patron in a booth at the club and Alterie was at another table a few feet away. Strauss got to his feet and began to weave through the crowd when Alterie unsteadily followed him and met him head on. Alterie yelled out to Strauss "Say, you, whaddya making faces at me for?" Strauss stopped surprised,"I wasn't making faces at you --- I never saw you before; you must be drunk!" he quoth. "Drunk nothin' --- I'll show you!" Alterie pulls out a gun and shoots Strauss through the right cheek which exits and hits his right arm and then his left. Strauss was taken to Lakeside hospital which was the same hospital where Alterie would later die in 1935. Alterie is arrested immediately by a policeman who was already in the club and taken to the Stanton Avenue station. Alterie had been drinking moonshine liquor all night before the shooting. Strauss in serious condition did not press charges after learning of Alterie's associations. Alterie is released. Louis Alterie under arrest hiding under the alias of Frank Ray from New York. In June of 1922, Alterie also known as "Ed Haynes" and Valley gang leader Terry Druggan are arrested at their Parkway hotel suites trying to high tail it out of town. They were suspected of stealing $50,000 in jewels. Alterie is with his first wife at the suite trying to pack their belongings when police barge in finding $3000 worth of the looted diamonds in Alterie's possession. Two high society women were held at gun point at the Green Mill Club and robbed of all their jewels. The police were tipped off by a woman who was Alterie jilted lover after she found out he was married. 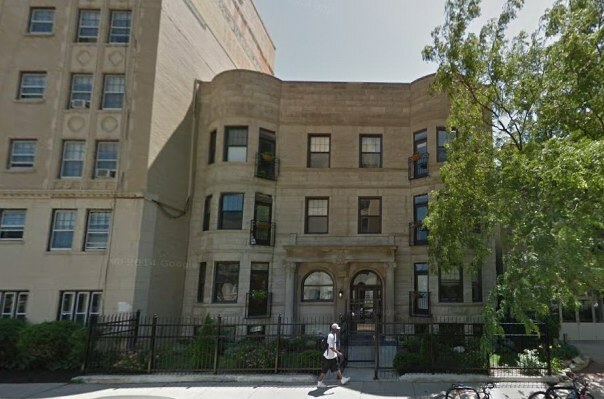 March 8,1924, Louis Alterie is mentioned as being President of the Chicago Janitors' Union living at the Congress hotel with his wife and doing business at his Gingham Cafe 6800 Cottage Grove. Alterie will hold the President's job for many years ahead and dying while vying to keep the title. 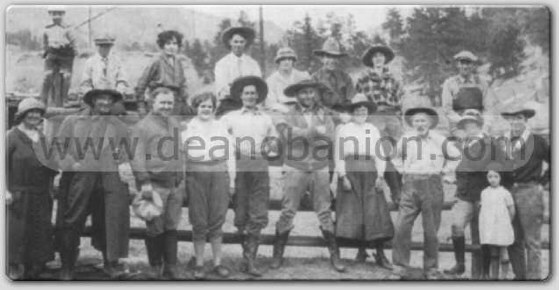 Dean O'Banion (Front third from left) and his new bride Viola at a Louis Alterie (Front sixth from left) owned Colorado ranch. His first wife Mamie is sitting on fence top third from left. May19,1924, Dean O'Banion, Louis Alterie, John Torrio and others are arrested during a raid at the Siebens brewery situated at 1470 Larrabee street. O'Banion had planned this charade for a while by selling his brewery to Torrio and then calling the police. He knows he and others will get off with bail but that Torrio already has an offence for Prohibition laws. He knows he will do jail time. O'Banion takes his money and leaves Torrio hanging all the while laughing. Torrio will bide his time and later repay O'Banion with death. 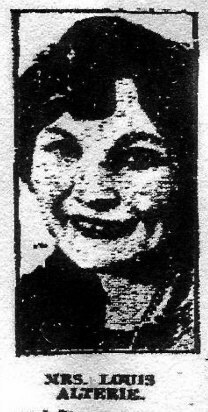 July 3, 1924, while driving in Lincoln Park Louis Alterie hits another vehicle hurting lawyer Kenner Boreman and his wife. Both are sent to hospital and while the Police are tending to the injured, Alterie shows a Cicero Police badge and gives his name as Lew Aleries of the Morrison Hotel. He flees as he finishes giving his info. The Police find out his true identity through his vehicle plates. Later, Alterie will send his lawyer to give up. 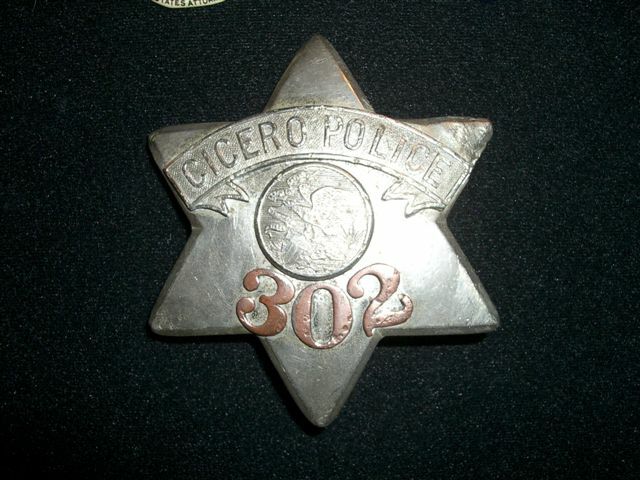 Not only used by policemen, these Cicero badges were found on a few gangsters. August 27,1924, Louis Alterie and companions drink it up at the Northern Lights Cafe at Broadway and Devon. His buddy gangster John Phillips is flirting with club entertainer Dorothy Kester. She rebuffs his advances and Phillips who is intoxicated starts beating up Kester. Alterie and crew immediately whip out there guns and shoot at the ceiling to ward off any heroes. Two policemen arriving on the scene are disarmed by the gangsters and taken hostage, thrown in the gangsters car to make an escape. Unbeknownst to them a police by the name of Frank Sobel is there also and not in uniform. He takes out his gun and kills John Phillips dead and scares off the others who escape. After two years of legal wrangling and the convienience of all the witnesses contracting Chicago amenisia, Alterie will walk from this mess yet again. Alterie's first wife, Mabel "Mamie" Alterie. November 10, 1924, Alterie's beloved pal Dean O'Banion killed in his flower shop in partly in revenge for the stunt pulled on John Torrio. Alterie shows up at Sbarbaros with guns bulging from his waist band demanding to see O'Banion's lifeless body before embalming. They initially refuse, but when they notice Alterie getting itchy for his guns they quickly acquiesce to a quick peek of O'Banion's remains. Seeing his friend and pal on the slab of Sbarbaros really got to Alterie, he who failed to show up at the flower shop that day O'Banion was killed due to a previous night drinking. During the funeral Alterie will exclaim in the newspapers that he will shoot it out with the killers on State street until one or all of them are dead by dawn and lying on slabs in the morgue. This causes a furor amongst the law and gangsters alike. 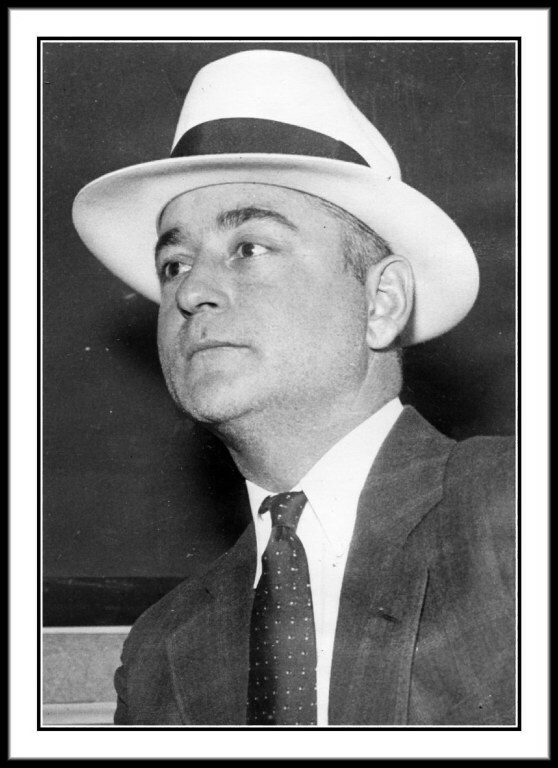 George "Bugs" Moran meets with Alterie and takes him aside. He tells him to prepare to high tail out of Chicago for good or else. Moran and the rest of the boys want him out. He is making the Northsiders look bad and bringing the heat on them. Alterie leaves for Colorado bringing one of the Gusenbergs with him. January 1925, the local Sheriff arrests them and holds them on ice until they are sent back to Chicago to appear in court for prohibition violations stemming from The Seibens raid with O'Banion and Torrio. In fear of losing his $5000 bond, Alterie goes to Chicago on his own will. (Special thanks to Andy Ward for the added info). 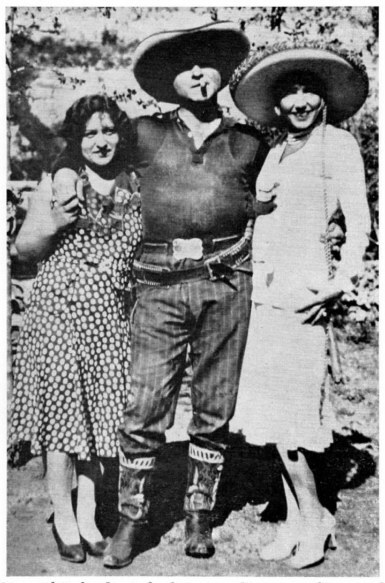 Alterie with wife Erma (left) and a friend at Diamond J Ranch, Sweetwater Lake, Colorado. On the evening of February 22,1925, while still in Chicago, Louis Alterie along with a blonde and two of his buddies were drinking at a club called the Midnight Frolics on Wabash near 22nd Ave. The patrons became very noisy and were called in. Captain John Stege of the Detective bureau, along with Lieutenant Edward Birmingham, and five detectives entered and confronted Alterie who supposedly had guns sticking out of his belt. Stege disgusted by the smug sight of Alterie slapped him in the face. Stege also siezed his three guns that Alterie had hidden under the table. Once bailed out, Alterie feels the mounting tension of the law and animosity from his friends. He finally makes arrangments to leave Chicago for a long, long while. Alterie leaves Chicago and Louis "Two Gun" behind (for now) and in 1925 becomes "Diamond Jack" Alterie. 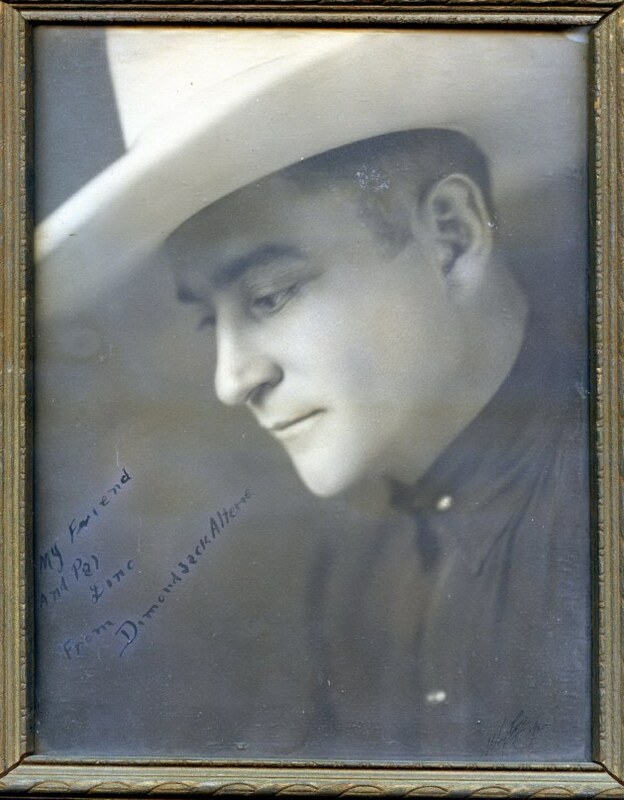 August 7, 1925, Diamond Jack Alterie stages a rodeo at his Sweetwater ranch at Jarre Canyon. January 30, 1926, Louis Alterie is involved in a car accident in Iowa. He and his chauffeur were coming from Denver, Colorado when the heavy auto, travelling 45 miles an hour swerved off the road into a ditch. They were both pinned down, but unhurt. January 1927, Alterie is divorced from Mabel Hays and marries his new love Ermina Rossi in Atlantic City the following month. June 4, 1927, Louis Alterie who has now bought the ranch at Sweetwater Lake is in business with his brother Albert to welcome wealthy types looking for the Cowboy experience. At breakfast, he and his brother get into an argument in which Louis orders his brother Bert to do something about saddle horses. Albert says no, to which Louis pulls out his buck knife going towards Albert. Albert grabs a shotgun and discharges it at Alterie hitting him in the neck,arm and shoulder. He is immediately rushed to Glenwood Springs Hospital hanging on to life. Dr. D.A. Hopkins will work tirelessly to stop the bleeding. He will make a miraculous recovery and in August of 1927 he will go to Washington Hospital in Chicago to remove the remaining buckshot in his body. It is at this same time that Chicago detectives visit Alterie in the Hospital and make him undergo mental evaluation tests. These tests were performed on various gangsters (Saltis, McErlane, McGurn etc..) in Chicago to see if there was a pattern of criminality running through their brains. 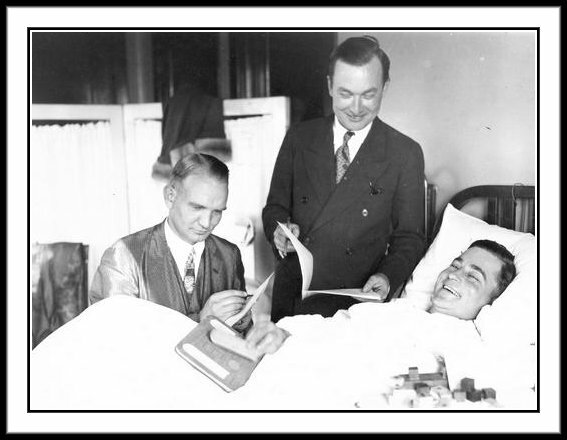 1927, Louis Alterie laughing in Hospital for gangster evaluation tests. This was done to find out if a person was criminally insane. Alterie is arrested in Denver on January 6,1932, for kidnapping a gambler by the name of Edward Dobkin. He is brought to Chicago tried and Acquitted of all charges. He is later questioned about the 1933 kidnapping of Charles Boettcher II, a wealthy Colorado broker. Alterie is let go. November 7, 1932, again back in Colorado, Alterie is arrested for shooting two men and beating another. George Barr of Grand Junction Colorado and Marc Waynick of Denve,r both salesmen, were shot in the legs in a hotel by Alterie. Hotel clerk Chuck Meehan was also beaten over the head with a pistol by Alterie. He had been drinking heavily. Police had stated that Alterie had previously engaged a pugilist by the name of Meryl Wayne "Whitey" Hutton of Grand Junction to a fist fight in which Alterie lost badly. Alterie was so incensed that he returned later to find Hutton and settle the score. He beat the hotel clerk to find out where Hutton was and shot through the doors thinking Hutton was there. He instead injured the vacationing salesmen. 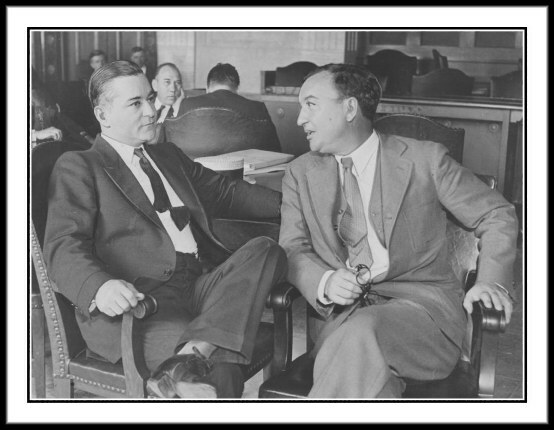 July 5, 1932, Alterie (right) with his lawyer on trial in Chicago for the kidnapping of gambler Edward Dobkin. He is acquitted on July 8th. For this outlandish outbreak of violence Alterie was ordered out of Denver for good or face major prison time. On February 1, 1933, He and his wife left again for Chicago. He could always rely on his good old President of Janitors' union job to reap in the profits. 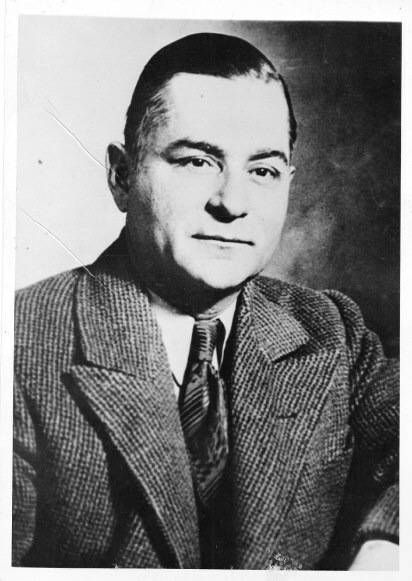 October 11, 1933, Alterie is arrested and his office raided at his Theater Janitor's Union office 509 South Wabash for taking money and promising jobs non withcoming. During arrest he is using the name L.A.Varain. Alterie will be arrested a few more times after this event. July 18, 1935, as he usually did the garage attendant left the Alterie's blue sedan ready on the street for their use. Erma Alterie was chatting with the apt. clerk while Louis stepped outside. Erma was usually the one who drove Louis around to his rendez vous'. The Alterie's where planning a trip to Wyoming and then close a deal on a Florida Golf club he had just acquired. Life seemed to look up after all that nonsense that happened back in Denver, Colorado. Alterie while standing in the street looks at his car when all of a sudden BANG! BOOM! BOOM! BOOM! BOOM!. The shrapnel hits Alterie in the face, neck and left arm. Lead shot also hits the facade of the building stonework. Erma standing in the doorway of the building runs to Alterie screaming and cradling her arms around her dying husband. 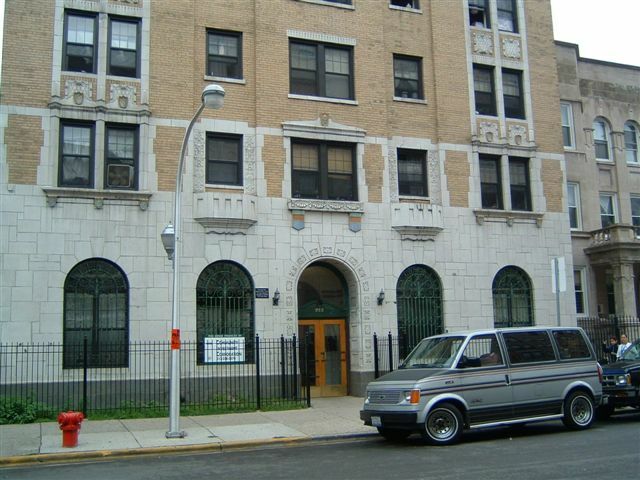 Alterie's last whispering words were " I'm sorry, but I'm going"
Policemen arrive on the scene and with the help of the adjoining building owner, they place Alterie into a car and rush him to Lakeview Hospital where he is pronounced dead. Eastwood Towers at 922-26 Eastwood where Alterie and his wife lived on the sixth floor. He was hit in the head and arm by bullets coming from across the street. He fell in front of where this lamp post is situated. Who killed Alterie? Was it because he kept coming back to covet the job of president of the Theater Janitors' Union once again? Was it because he wanted a bigger piece of the pie in trying to take over the Motion Picture Operators Union? I think both were the cause because Frank Nitti by this time had the Outfit out on the warpath against old remenants of the gang. Gus Winkeler had just got his two years before and Nitti was now paranoid Alterie was going to come back to Chicago, stir trouble again like the old days and bring the heat of the law on his Outfit. The theory of the people from Denver exacting revenge on Alterie is a weak one. The hit was a classic Capone gang hit, rented room by another guy and killers lie patiently in wait. Two killers in the apt. across Alterie's building and one on the sidewalk in case. The killers flee out back to a waiting car. A newspapers artist's diagram of killing. 927-29 Eastwood situated across the street from Alterie's apt. building. Hitmen fired from first floor of front room at left (Fence). Guns are found on the first floor apt. bed. The police find one .351 Winchester repeating rifle with telescope and one 12 gauge shotgun. The Winchester is traced to a New York arms dealer who has had shady dealings with gangsters in the past. Nothing ever comes of the investigation and the killers are never found. 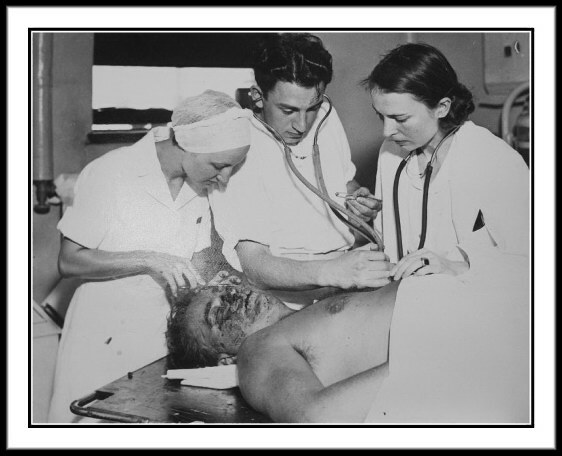 Alterie in a coma dying at Lakeview Hospital Chicago 1935. After the autopsy is performed and the coroner's report filled out, Alterie's body is taken to Hursen's funeral home at 929 Belmont Ave. for embalming in order to ship his body by train to his birth home of California. 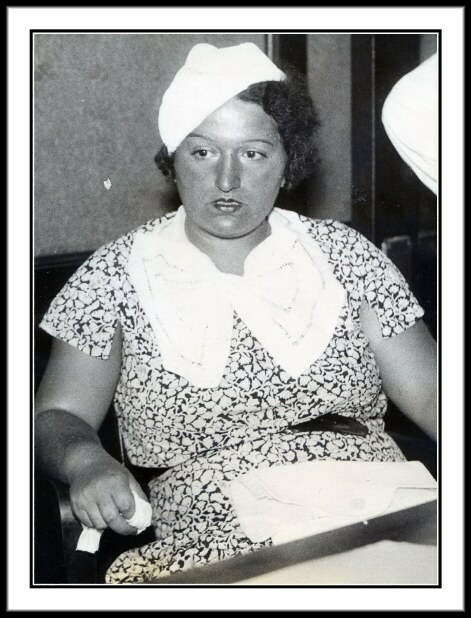 Ermina (Erma) Rossi, Alterie's wife immediately after his killing being questioned by Chicago police. Alterie laid to rest in an unmarked grave at Forest Lawn Memorial Park, Glendale, California. 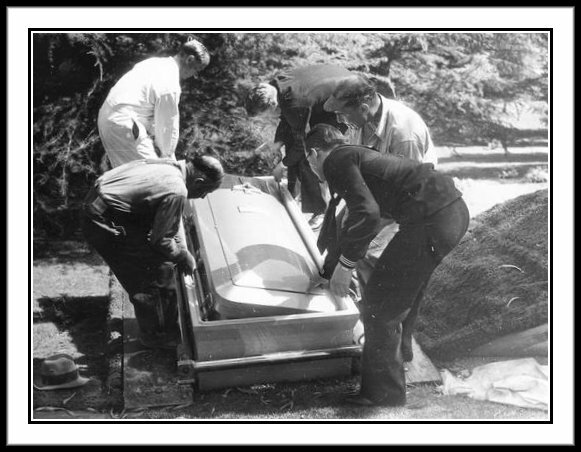 He is finally laid to rest in his costly bronze casket on July 23,1935.